This is fantastic.. I love the look and feel --- and content of your blog site (2 words?) We still don't have a way out of this media conundrum. It takes resources to put out credible information but readers used to getting info for free may not want to pony up. Thanks for your feedback, Leema. So glad you liked my blog. Yes, unfortunately newspapers should have never offered their product for free in the first place. It will be tough to get readers to pay up but as consumers, if we want to continue receiving credible and top-notch news and analysis, we have to be willing to pay for it. 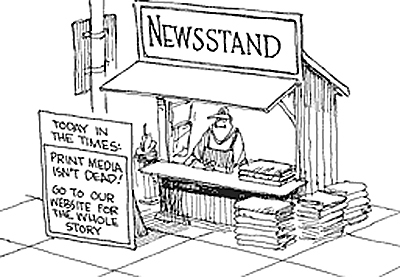 Without that, the print journalism industry will not be able to survive. And even if it does survive, it will not have enough resources to put out quality information, which I think is needed in the long run as the Web continues to become noisier. Hi Farida - I have been saying exactly the same thing. I think the problem that news organizations and book publishers are having is that they need to figure out how to leverage the credibility that comes with their name recognition. New orgs don't like to think of themselves as brands, for obvious reasons, but they need to in order to stay in the game. Look at what the Huffington Post and Daily Beast have been able to do starting from scratch, in terms of finding a workable business model. Newspapers should provide their content for a fee. It is after all the hard work of reporters and editors. Why give it for free then? If the content and research and stories are given for free, people will take it for granted. As I write this, I wonder what other countries do? I have never researched on what other countries do as far as their online media models are concerned. Great blog Farida! It's evident on the amount of thought you've put in making your blog - the books you recommend, your posts, illustrations. Good luck! @Lisa Thanks so much for reading and sharing your insights. I couldn't have said it better. These days when even we, as individuals, need to have 'personal brands,' newspapers are no exception. It really is time for them to notch it up & make people see the value they provide. I was just reading this article yesterday (http://bit.ly/b0mDYe) on how AOL and Yahoo are entering the online news business in a big way. The advantage that HuffPo and Daily Beast have is that they aren't straddled by the costs of operating printing presses & distributing the paper. They started off directly online (it's also why Netflix has killed Blockbuster) and are managing to thrive. The market for news definitely exists, it's just that newspapers need to get customers to pay up or find other means to survive. @Amishi Thanks for your comment. As former journalists, we know the hard work that goes into reporting and producing news. In countries like India, as you are also well aware, people want to read a physical newspaper, since the Internet penetration is not so deep. But I think things will change there too (and it will happen sooner than most people expect. That's what happened in the U.S.) In the U.K., I know that papers like the Financial Times have adopted the part-payment model. Thanks for the positive feedback on my blog!